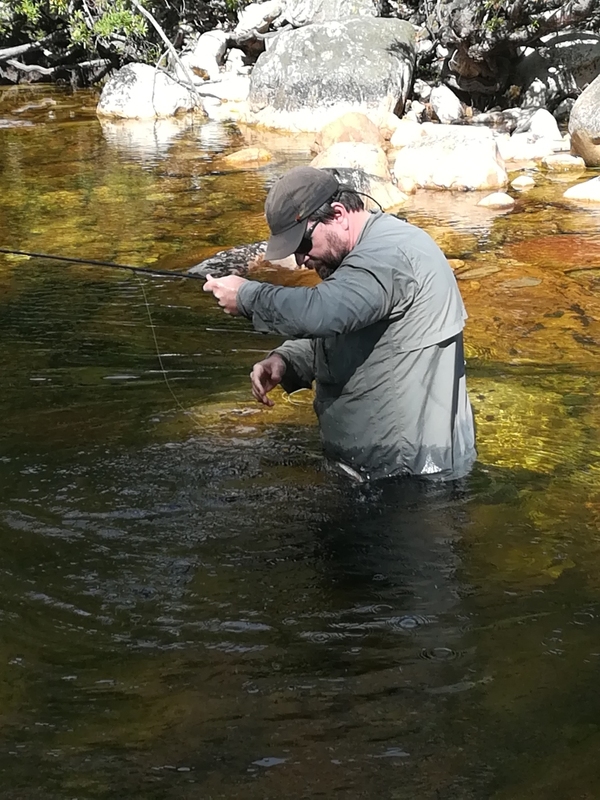 It was an odd day on the water, guiding an old client who had moved from Cape Town and now resides and fishes in the West Country on the streams of my home county. Andrew had learned to tie flies with us back in the days when we owned a fly fishing shop and ran tying sessions every Wednesday. That was decades back and it made me realize just how long I have been knocking around the fly fishing scene, hopefully positively influencing generations of fly anglers and fly tyers in that time. Now I was guiding someone who fishes “my home waters” on what used to be his home waters, a curiosity of sorts. We aimed to hike high into the hills in the hope of more shade and cooler water, the rivers are low, it is mid-summer, the flows are slight and the clarity near crystal but for the slight tannin hue which never truly leaves these rivers. It is better to head out early, not that the trout care one jot about that, but it means missing the commuter traffic on the cloged highways of Cape Town , affords the time to stop for coffee and most importantly means that the hike is undertaken in cooler conditions and thus far more pleasant. In the high mountains the valley sides provide shade and keep the water cooler. Ours was the only car in the car park, being a week day that isn’t a rarity, the hordes of walkers that frequent the place on the weekends no doubt stuck in those long lines of vehicles we thankfully passed on the way out of town. 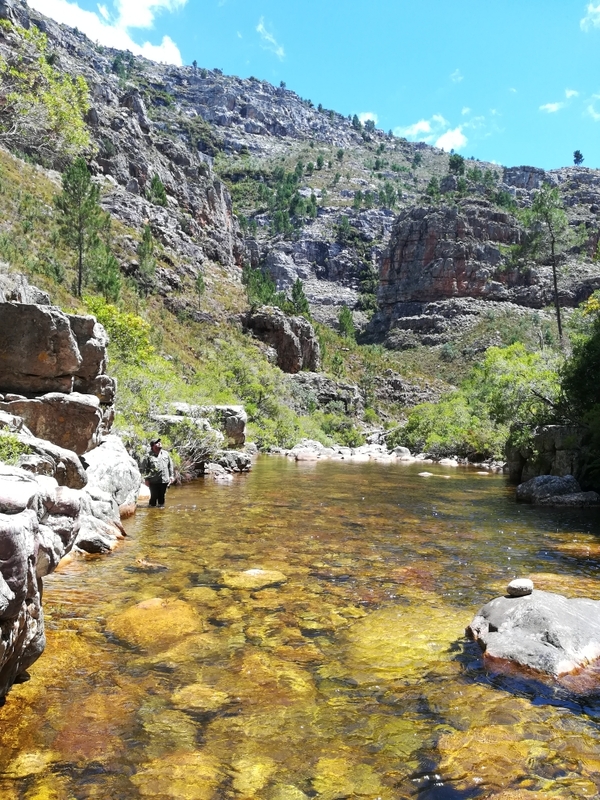 The weather was set to be a tad cooler than the past few days, there was a fairly stiff breeze, upstream at the start of the day at least, and not a fish moved when we arrived at the cave pool and the start of our beat. This isn’t anything unusual, as much as it goes against common fly fishing wisdom, in these parts the fish wake up late and seem to rather like the sun, activity usually picks up once the sun breaches the high walls of the canyon and lights up the water. Whether this influences the fish directly or simply has effect on the insect life I am not sure. But you can certainly be on the water too early, a quirk of these streams. As predicted the fish started to move once the sun got onto the water. A first fish of the day on a small dry fly. Once the sun was on the water, the activity, as predicted, picked up and Andrew was into his first fish in short order. 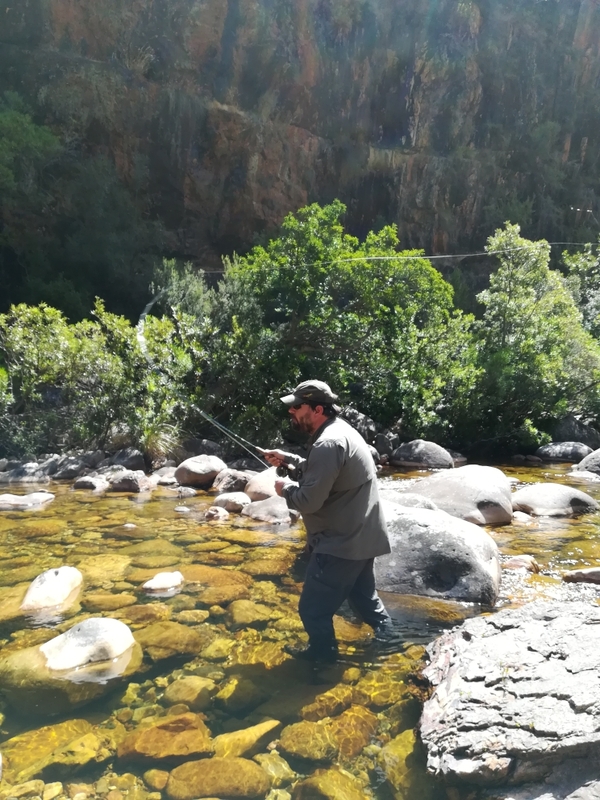 We fiddled with the leader to get the set up just right, and to suit the prevailing conditions and once set proceeded upstream searching out fish. As is so often the case, having not fished for several months over the Northern Hemisphere’s winter months Andrew was rusty , and what that generally means as that one mistimes the strike. Over and again he missed fish that we had carefully stalked, but he was doing well, raising far more fish than he scared. Just a case of not putting them in the net. Spooky fish require that one uses all the cover you can get. The fishing wasn’t on fire but we found fish in almost every run were we looked. Gradually the old skill sets returned, a bit of practice and Andrew was converting some of those strikes to landed fish, the ratio of misses to hits turning like the tide. It was at this point that we found a net hanging in a tree, as though left their for a needy angler who might have forgotten his own. We resolved to bring it back with us on our return and try to locate the owner via the local fishing club’s Facebook page. After a few more fish we found an iPhone, laying in a shallow run , I knew who it belonged to, a client had lost his on the stream just before Christmas and we had at that time been unable to locate it despite a determined search. 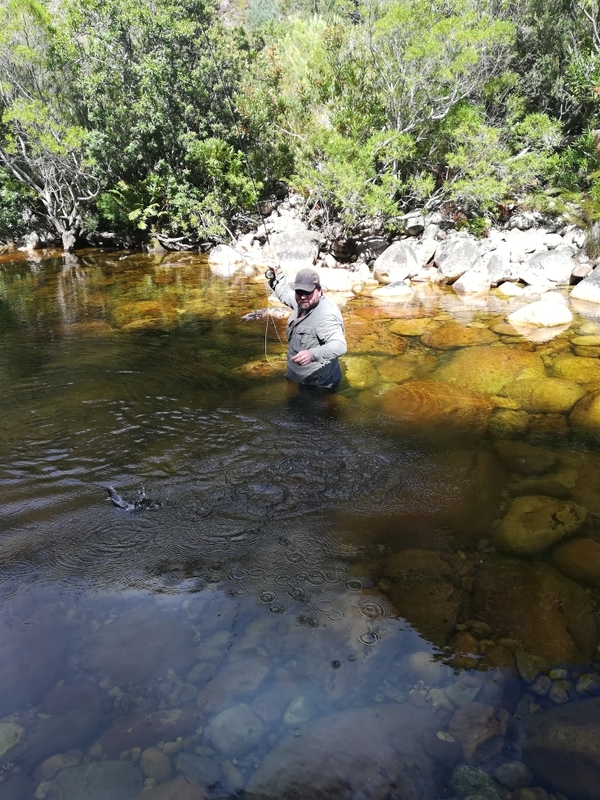 At this point we found ourselves in the position of targeting a large trout, holding and feeding quietly in the limited flows of a shallow corner run. He would look at the soft hackle which had provided most of our success for the day but wouldn’t commit to it. Two, three, four casts and each time he would tip his fins, inspect the fly and then apparently get the jitters and back off. More than once we feared him spooked and then he would reappear in the shallow run, moving in time with the flows. The sort of liquid fluidity that marked him as a sizable fish, occasionally rising slowly with the languid flap of a tail that is a sure indicator of mass. 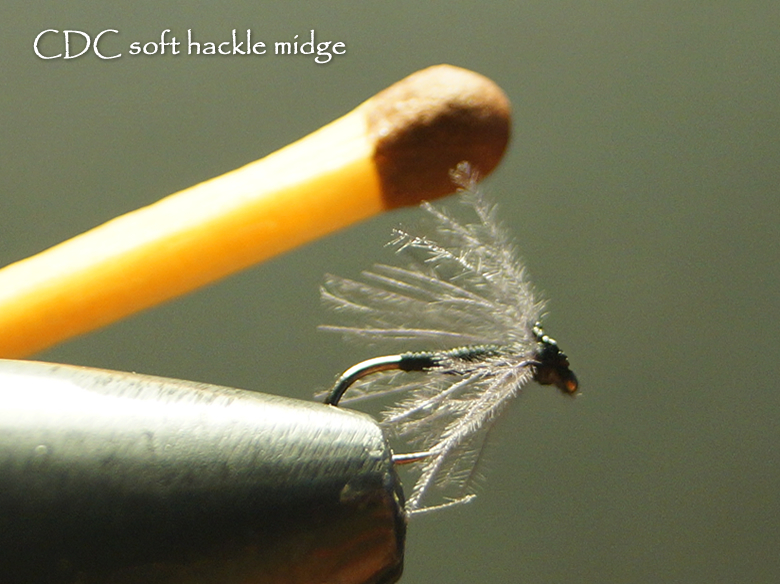 This CDC soft hackle has been tremendously effective but on this occasion the ant proved a better bet. 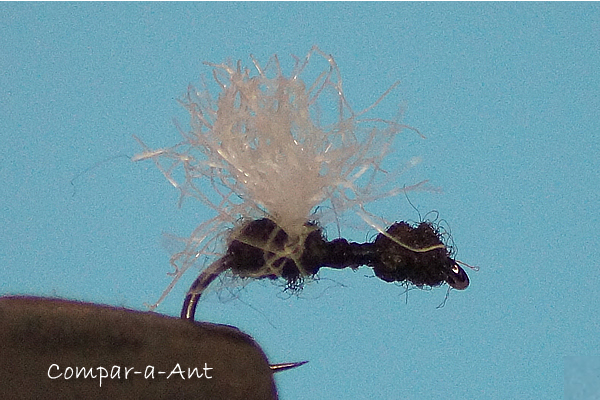 Now years back I would often use a diminutive ant pattern of my own design on “difficult fish”. It seems as though the fish have a “thing” for ants and it can turn the balance between caution and desire. So we affixed a size 18 “Comparant”, onto the 7x leader and Andrew cast again. This time something was different, from the moment the fly hit the water one could see the fish “lock onto it” In my mind I could virtually hear the “beep beep, lock on , target acquired” of some imaginary Top Gun soundtrack. There was no doubt that this fish was going to eat that ant, but we had to wait for him to get to it. The fly drifted slowly around the bend, the fish tilted his fins and we held our breath waiting for the inevitable slow roll as he sipped it in. But all of a sudden the fish could wait no more; he accelerated and smashed that tiny fly as though he wanted to kill it. Andrew overreacted and missed the strike. The fish vanished.. An unsatisfactory end to a wonderfully intense and intimate encounter, and just one more fish that will haunt our dreams for years to come. But it did remind me to try the “ant trick” more often again. It can be a wonderful ploy to fool an “educated trout”. As we sat mourning our loss a huge eel swam downstream, as thick as my wrist and probably a metre or more long. I don’t think that I have ever seen an eel here before. He rolled over the boulders and seemed to flow with the current as he passed us. Eventually slipping over a small waterfall and into the pool below. Perhaps heading downstream for a hot date in the Sargasso Sea? 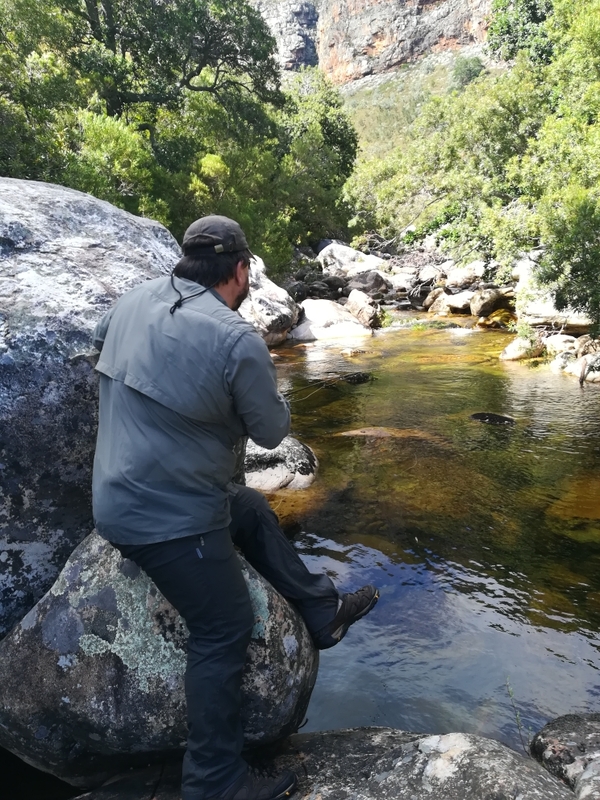 We fished on for a while and then it was time to undertake the long trek back out to the car, an interesting day of targeted sight fishing to spooky trout in clear water. Those people in the commuter traffic missed out on a great day. Author’s note: The “Comparant” is a simple winged ant pattern, designed specifically to be both imitative and visible. The crucial element in the author’s opinion is that it has nothing obscuring the slim waist which seems to be a clear trigger to fish in identifying ants. Many commercial patterns , being over dressed and hackled lose this critical trigger and seem less effective as a result. The Comparant is one of numerous simple and effective flies featured in “Guide Flies” a book available in various formats from the “Inkwazi Flyfishing” book shop or downloadable from Smashwords. Guide Flies features, text, graphics and video content, discussing both the logic behind the various patterns and how to tie them. Simple and Durable Flies that catch fish.